Both anecdotal evidence and empirical studies have demonstrated the importance of a project manager’s knowledge and experience as key success factors in information technology projects. What a project manager knows is certainly important and has been the subject of many research studies; however, who an information technology project manager knows is also important. 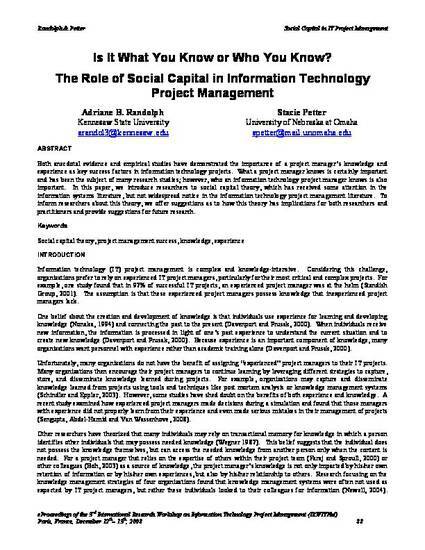 In this paper, we introduce researchers to social capital theory, which has received some attention in the information systems literature, but not widespread notice in the information technology project management literature. To inform researchers about this theory, we offer suggestions as to how this theory has implications for both researchers and practitioners and provide suggestions for future research.